I was recently contacted through my website by someone requesting help in finding a threshold to replace the damaged one on their home. As I was discussing the issues they were trying to resolve, I realized I’d had similar conversations many times over the years. So replacing a threshold seems a worthy topic for this blog post. Because many doors are such high traffic areas and because they have to seal out the elements while allowing easy entry, doors receive a lot of wear, and no part of a door receives more abuse than the threshold. It has to bear the weight of everyone that passes through the door and must also seal out water, air and bugs. If the door was improperly installed, is lacking in maintenance, or is subjected to excessive moisture due to it’s location, the threshold and the jamb where the threshold attaches are one of the first areas of a door unit to fail. in it’s proper position. The threshold may then rock or shift when it is stepped on or when the door is closed. Unfortunately properly replacing a threshold is quiet difficult and time consuming. There are many different types with only some of them having replaceable components. 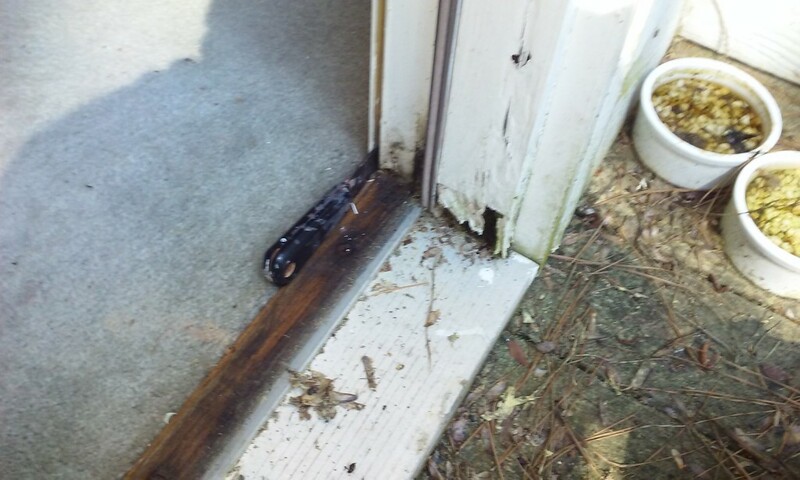 Most thresholds are an integral part of the door unit and requires removing the entire door unit to properly replace. Because of the difficulties in replacing a threshold and the amount of labor required to do so, I find that most clients choose to replace the entire door unit. The good news is that new door units are available with a FrameSaver jamb package. For extremely wet areas an additional upgrade to vinyl brick molding is also available. All thresholds now have a no rot composite or vinyl insert underneath instead of the wood inserts found on older doors. Door units with these upgrades should far outlast most older doors and even the newer ones that don’t have the FrameSaver package. Some older doors have wooden sills with aluminum thresholds mounted on top. This type threshold usually has a rubber gasket along it top that may become worn. Both the threshold and the insert may be easily replaced in this type door. If replacing a threshold is still the chosen option, check with the mill-work shop at your local building supply center or at one of the big box stores. If they don’t stock the threshold you need they should be able to help you locate a source for your type threshold if it’s still available. Once an exact match for the threshold is obtained, the door unit will need to be completely removed from the house to allow removal of the old threshold, which will be fastened to the bottom of the jamb with either staples or screws. After carefully removing the fasteners, the old threshold may be removed and the new one fitted in place. A good quality sealant should be applied between the new threshold and the bottom of the jamb prior to attaching the threshold with exterior grade screws. The door unit is now ready to re-install using the procedure recommended by the door manufacturer.